Lagos State Emergency Agency (LASEMA) says efforts are ongoing to save persons trapped in a train accident that occurred around Ashade Ram Market in Agege area. The accident happened around 7am. According to update released from the agency at 11am, the train moving en route Ebute Metta via Oshodi from Iju with full capacity passengers derailed from its tracks. 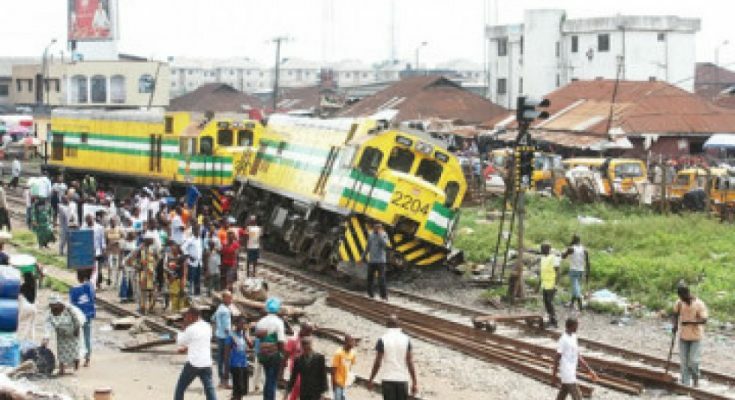 “Further investigation revealed that the train derailed as a result of faulty tracks at the level crossing which has been reported by LASTMA men in the area and was noted for pending engineering works tonight”, it read. “No life was lost but information gathered at the scene from the bystanders has it that the wounded victims were rushed to nearby hospitals for medical first aid. “Efforts are currently on ground to evacuate the derailed coaches as the NRC crane has been despatched to the scene from Lagos Island.